A new type of brain-balancing center is opening worldwide via tele-health. 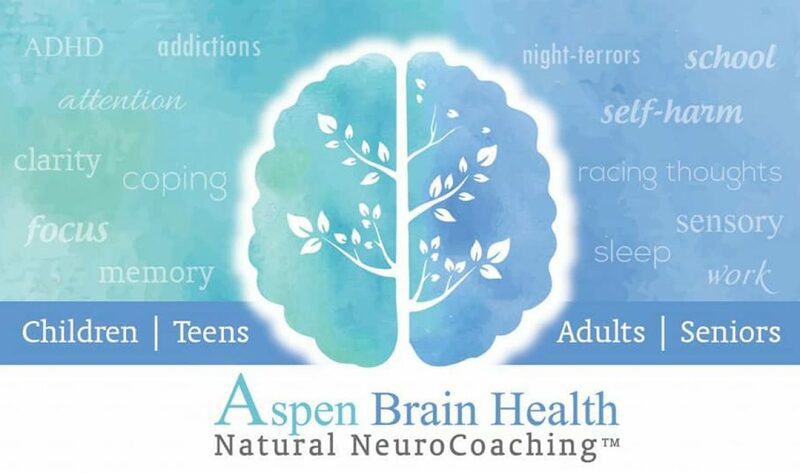 Aspen Brain Health helps kids, teens, adults and seniors with neuro-functional issues utilizing a non-medical, med-free program. Aspen Brain Health focuses on identifying the underlying issue and correcting it naturally. Aspen Brain Health is a non-profit founded by local best-selling author and certified cognitive coach, Aspen Morrow, CBHC, CPSS. The new center is headquartered at 207 W Georgia, Ave. S, Suite 150, Nampa, ID 8686, inside Syringa Behavioral Health, but accepts clients world-wide with tele-health options. Aspen Brain Health’s staff will work with clients between the ages of 2 and 102, many of whom have been diagnosed with neuro-functional issues, such as Attention, Focus, Rage, Cutting, Concussion, Memory Loss, ADHD, Dyslexia, Sensory Processing Disorders, Asperger’s, and even Job, Sports, & Brain Performance. of clinical-grade supplements. Officials with Aspen Brain Health cite recent research from the U.S. Centers for Disease Control and Prevention which indicates that the number of ADHD diagnoses has increased by nearly 25 percent in just the last decade. While medication is the most well-known approach to minimizing symptoms tied to neuro-functional issues, Centers like Brain Balance in Eagle, ID, Amen Clinics around the country, and now Aspen Brain Health in Nampa, ID, offer an alternative route to prescription medication treatment. Aspen’s Med Free Method™ Program is designed to test and address the root causes of neuro-functional issues, not just the symptoms, and typically includes brain-type testing, results interpretation, and a customized med-free supplement and nutrition plan based on each client’s unique test. The costs are typically less than 25% of any other medication and drug-free options available. Their customized program is backed by over twenty years of research with outstanding recovery results as high as 85% according to the 15 universities involved in the research. Over 100 evidence-based studies have shown that micronutrient and orthomolecular support protocols have shown outstanding results for brain concerns. Aspen Brain Health was founded in 2012. Syringa Behavioral Health, locally to Treasure Valley, Idaho, also offers licensed counseling services, EMDR, Trauma Informed Counseling, CBT, and Rational Emotive Therapy. The enemy handed me a weapon! I had a vision. In the vision, Believers were given weapons, some by God, and some even by the enemy! Some had bows with fiery arrows, some had staffs, and some rods of Strength. Some had built-in weapons like fire 🔥 on their hands. There were darts 🎯 labeled “words” and weird things that looked like millstones. There were nooses and flaming ⚔️ swords. Some were on foot, some horses, and some on lookouts. The enemy was laid out in masses, people he had blinded standing row upon row like dumb zombies, half asleep. But then the Believers, instead of advancing on the enemy, loosed their weapons on each other! The friendly fire 🔥 was horrible!! People were chopped down by those closest to each other, and were burning down churches ⛪, and ministries, and platforms, but not by the will or order of the Father! The enemy sat back and laughed and pointed! Then his minions advanced on the carnage. As I have been traveling to different groups of Believers over the last year, following only God’s promptings and requests, I have found truth and attacks of the enemy to deceive in almost every group (the enemy doesn’t bark at parked cars going nowhere! ); but the thing in common most of them had was “dogging” on other groups of Believers. They put down traditional church, or no church, or home church, or supernatural church, or so and sos ministry. Some said the “sign gifts aren’t for today”, or “tongues have ceased”, quoting Scripture to defend every point….while the tongues-speaking believers put down the cessation camps…sometimes using the same Scripture! And the Lord just shook His head. He has placed each one of them like chess pieces, each capable of reaching someone. We are all a hand, or a foot, or a finger, not a one better than the other. He is no respecter of persons, but He did whisper to me one day that some of His best friends are on the “heretics list”. I think He is calling us all to come up higher, and attack the enemy from higher ground. Where he becomes a little snake in the grass, and our petty differences become the beautiful squares of a tapestry He is knitting together. That no one teacher or camp or religion or doctrine holds all the answers, that we still see as through a glass, darkly. Lets first look to Him! Let’s start trying to see face to face, fight back to back, and link arms with all the ones who profess Jesus Christ came in the flesh, died and rose again, and quit trying to “expose” our brother and sister, and “expose” the enemy instead. “Jesus knew their thoughts, so He said, “Any Kingdom at war with itself is doomed. You say I am empowered by the prince of demons. But if satan is fighting against himself by empowering me to cast out his demons, how can his kingdom survive? And if I am empowered by the prince of demons, what about your own followers? They cast out demons, too, so they will judge you for what you have said. But if I am casting out demons by the power of God, then the Kingdom of God has arrived among you. For when satan, who is completely armed, guards his palace, it is safe— until someone who is stronger attacks and overpowers him, strips him of his weapons, and carries off his belongings.” Luke 11:17-21. Lord, I declare that people really seek your face before they speak a word against your people. That we carry weapons of light, harmless to each other but deadly to darkness. I speak love over every disagreement, Peace in every situation, correction in love, calls for repentance and turning toward God. A dance where when someone misses a step that God is allowed to lead and instruct without the Body chopping off the foot. Where 70X7 is the math, and the equation is purity and holiness squared. I declare the weapons of the enemy disarmed, trophies confiscated and schemes exposed. That lying and hateful tongues are silenced and TRUTH be the only voice at the microphone. Eradicating Suicide. Blow the trumpet. I wanted to feel up to making a video for world suicide prevention day, but after a quick trip to Spokane, street healing, I wasn’t up to being seen in my day-long PJs. But my take on suicide prevention is different than many of the posts today. I WAS that teen, who, at thirteen, following molestation, imagined all the ways I could kill myself and get away with it. I know most people don’t relate. They don’t relate to the cutting scars on my arm or the stigma people still flash at me like a pity smile when they hear about my book. But my take on prevention and cures is different than most. I know of a cure that helps over 85% STOP the thoughts. STOP the rumination, STOP the CUTTING, self-harm, self-loathing, regret, shame, loneliness, hopelessness, and hatred. I have to sit by and watch people needlessly die. Needlessly suffer. Needlessly be stuck inside a head that longs for relief, for the thoughts to stop, for the whispers to stop, for the pain. To. Stop. I am quiet most of the time when the CHURCH says it’s demons, or the person’s fault… or a chemical imbalance, or their “selfishness”, while a cure has already been found. I have seen thousands recover, while millions die. I spend every day helping the ONE put in front of me, while I want to shout from the rooftops and STOP it in its tracks. Everywhere. Worldwide! I have to watch friends post who won’t even let me help them or their children, who think this epidemic has no remedy, when actually the quite opposite is true! I have seen a woman screaming in her sleep from night terrors and weekly suicidal house calls from the police turn around with JUST mineral pink salt. Her husband reported her LAUGHING in her sleep even while they couldn’t have even afforded the gas to get to a doctor. I have seen a woman who is an amazing Christian, who got suicidal every FALL like clockwork for twenty years turn around and call me each year when another one goes by suicide-thought Free. I sit with people to try and keep them out of the hospital when it gets bad. But so many people don’t know an effective cure has been found. It seems all I do will never be enough. I want to 🛑 STOP ALL suicide. And i won’t settle for anything less!!!!! Why do I believe this is possible?! Because once upon a time, Scurvy was an epidemic. And for 264 years, a cure existed that nobody knew about! Pills were pushed and it was a medical mystery. But then Vitamin C became the known cure, and scurvy is mostly eradicated! Let’s eradicate suicide before another 264 years pass! There is an effective natural treatment almost as simple as vitamin C. These thoughts come from hangry deficient brains, and can be fixed! I don’t know how to FUND a remedy with little profit, or make a big enough dent in the message, but i do KNOW that I believe suicide can and should already be ERADICATED!!!! What will it take? Cause I’ll do it. I will hit the streets and continue opening my clinic for free. I will speak for those who cannot speak for themselves. I will let them touch my scars and show them they can come out the other side. All it takes is a spark of HOPE, and a MIRACLE cure, and I have BOTH!!! I have so many blueprints God has shown me that sometimes it feels like my brain will explode architect plans! I have had visions over countries, regions, cities, churches, ministries, natural disasters, friends, business ideas, inventions, family, my marriage, my kids, and even the land I live on (pretty much everything BUT politics, thankfully)! Most of these ideas are not even for me, or about me, but to pray into or give away freely. There is always more it seems! Since this began more intensely around 2002, many of them have come true. They did not come to pass like I thought they would with my limited scope, but all of them came about exactly as God had shown me in the vision! But the challenge is looking around at the MESS that is NOW, and seeing HIS WILL being done over it. The MESS of our country, the MESS of abortion, the MESS of mental health issues, the MESS of our house, the MESS of our finances… whatever you may feel is a MESS right now. Yet GOD. Yet God can move mountains, and calm storms, and walk through walls and on water, and chooses to be mindful of us! US, who can’t seem to cook, or clean, or manage laundry, who makes a bigger MESS in every space we occupy. In this picture, I cling to HIS promise of a “Before” (my NOW mess) and “After” (His ideas), even when we take steps backwards! A promise He showed me over a year ago, of a prayer heart garden that will bless many (like the first year of this garden when I was able to gift 30 huge bouquets of flowers to women and made them cry!). Of a pole barn and greenhouse in the back with a discipleship, equipping, healing counseling center where His sheep get fed and healed and sent out to heal the sick as well. I never even thought of having a ministry, since becoming a missionary didn’t work out. YET His plans. YET My obedience. YET Hauling woodchips, weeding MESSES. Planting without reaping. The cross before me, the world behind me. No turning back, no turning back. Whatever your mess, I promise He has a messAGE for you. He has a time and a season. Even if you can’t see it, even if you can’t hear it, even if you don’t know it! He has a blueprint over your life, and it is for your good. He is spinning a tapestry and brooding over you like a mother hen. He is gathering you under His wing. He is collecting your tears sown in sorrow and will turn them into a harvest of great songs of JOY! He sees you. He knows you, He sees each hair, each tear, each hope, each dream. He put them there. He will fight the battle and hand you the victory. It’s just the way He is. But if you, like me, are in the middle of your MESS… without a way to see HOW to get from here to there, TRUST in the WAY, the TRUTH, and the LIFE. He will get you there.